Ordinarily Murchad liked rules. They chafed sometimes, but he could always reassure himself that they must have been made for a reason. If passengers and cargo could not leave a ship until it had been cleared by the harbormaster, doubtlessly it was to prevent the smuggling of taxable goods or outlawed men. Ordinarily Murchad didn’t mind. 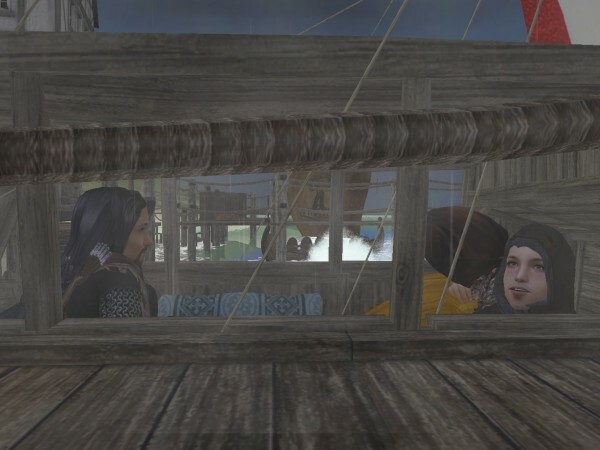 Ordinarily Murchad wasn’t responsible for two delicate, shivering, seasick young women. “From the tavern, more likely,” Sadb grumbled. The rigging creaked, and the ship bucked and jerked against its mooring ropes. Just when the girls had been getting used to the slow plunging of the open sea, they’d been turned over to the choppy waters of the harbor. Uallach lay spent against Murchad’s shoulder, limp as a wrung out rag doll. Across from them, Sadb sat bundled up in her water-​stained skirts, looking green. 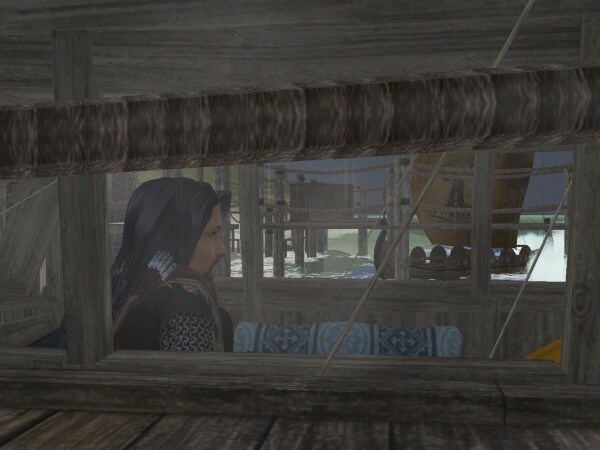 Murchad called back to Morrann, behind him, leaning against the wall of the cramped cabin. Murchad hesitated. He wanted that very much. But rules were rules, and their ship hadn’t been cleared to disembark. Murchad had to be careful in this town. The King of Dublin found it inconvenient that Murchad wasn’t dead. Uallach’s eyes fell closed and opened again. “The horn?” she guessed. “Plunk you in a bowl of water, and you’ll be pretty as fresh-​picked in no time,” he promised her. Or rather, tuck them side-​by-​side into a warm bed with matching bowls of broth, and leave them sleep until morning. He hoped it would revive them enough. They still had to ride eight miles north to Two Ladies. Murchad had pointed it out to them an hour or two ago: the tiny dots of whitewashed cottages speckling a gray-​green slope shrouded in rain. He had been more than merely chafed by the rule that had obliged him to sail right past. That rule had burned so badly he’d even considered stopping. His permission to leave the country merely stipulated that he and Morrann had to return by Dublin; it said nothing about his sister or his brother’s widow. He might have sent the girls ashore and spared them a day of travel. But rules were rules, and in Dublin he was wise to follow their spirit, and not merely their letter. 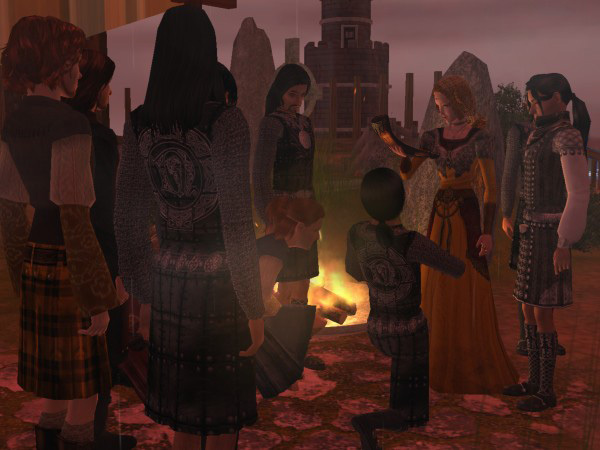 Uallach was the granddaughter of King Diarmait; and Sadb was the daughter of Cu Mara of Mull, carrying the great-​grandson of King Diarmait in her womb. Murchad feared Dublin’s current king would be none too happy to learn they’d been smuggled into Ireland. His father, the elderly High King, still less. 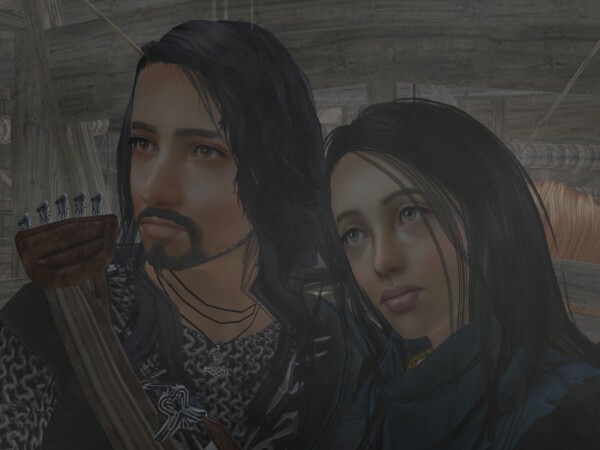 But Uallach had been weak even before they’d set sail, and now she could hardly lift her head from Murchad’s shoulder. Her shallow breathing scarcely warmed his neck. He prayed he hadn’t made a fatal mistake by following the rules. They sat in silence for a while. The rain grew heavier and rumbled on the roof. A few men came out onto the dock at last—Murchad perked up—but they hurried off to load a slender ship that strained against its mooring ropes at the next pier. The workers’ thunking and clanking came muted through the downpour, making the world outside of the cabin seem far away. Murchad tried to look, but his sister’s body slumped against his side and prevented him from twisting around. He shifted uncomfortably on the hard bench. 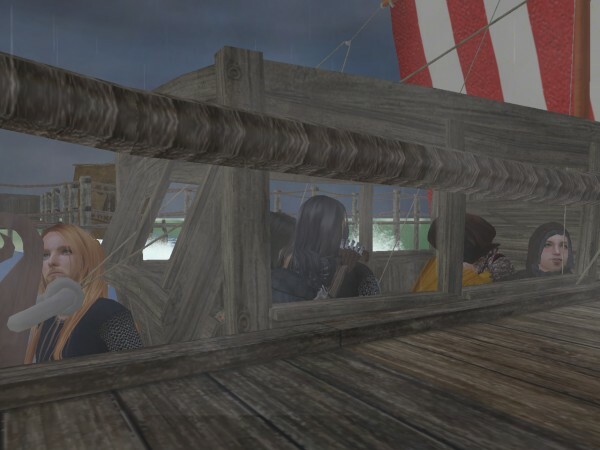 “Probably wondering what kind of merchant comes sailing into harbor on a rainy Sunday afternoon,” he suggested, snatching at the first comforting explanation that crossed his mind. “Want me to go see what’s brewing?” Morrann asked. Father Gilla Mochutu lifted a brow and watched Murchad for a reaction. Murchad lowered his eyes and chewed his lip. As a landed warrior under Murchad’s command, Morrann was required to report directly to the castle, too. And he hadn’t been cleared to disembark. Those were the rules. “Aye, lord,” Morrann said, though he sounded unconvinced. “Mayhap as they haven’t been told,” Murchad said. Murchad squirmed. He knew he was failing the girls, but if there was one thing he could not do, it was presume on his title: strut around, stick out his chest, and demand of everyone whether they knew just who he was. But before he had a chance to answer, they heard a mighty rumbling, like a barrel the size of mountain rolling over a dock the size of the sky. Uallach shivered closer, and Sadb made a face like Cucu’s when he laid back his ears. Morrann heard the change in his voice and leapt up without awaiting further orders. Murchad laid Uallach back against the pillows. “Won’t be long now,” he promised her, and she smiled. Then he stuck his head and shoulders out the window and pulled himself through. Halfway out, sitting on the sill, he paused to tip up his face to the rain. Cold drops stung his cheeks and eyelids, but he took a grateful breath. It had required a nudge from heaven, but at last he was doing something. He wasn’t completely worthless. “Get your sword,” he told Morrann as he heaved himself up onto the dock. Morrann answered with a twist of his hips that showed off the weapon he already wore. Murchad grunted in grim satisfaction and stooped to take the sword that Father Gilla Mochutu passed through the window. The Lord of Two Ladies and his household troops were permitted to wear arms in the streets of Dublin. Those were the rules, and by the Cross, Murchad intended to see them followed. The men threw off their cloaks and swung themselves up onto the dock. For the first time, Murchad turned towards the town. Something was not right. Sunday it might well have been, but there were too many men, and not enough of them working. They watched from the ramparts and from the shore. Their words were muffled by the raindrops drumming on the dock and by the water hissing below, but they were talking among themselves. They were excited. Morrann gave Murchad a dire look. Murchad wondered how long it would take to throw off the mooring ropes and get the ship under oar. No dock worker stood at the end of the dock, but a green-​garbed warrior from the city guard. At least he was alone. Murchad conjured up a brazenness he did not feel and strode down the boards to confront him. The guard cringed. Murchad’s act was working better than he’d expected. There was no “but,” or at least the man wasn’t capable of revealing it, for he simply wrung his hands and looked apologetic. “So are we cleared to disembark or are we not?” Murchad’s voice had risen to a shout, and it evoked a murmur of incomprehensible commentary from the distant crowds. 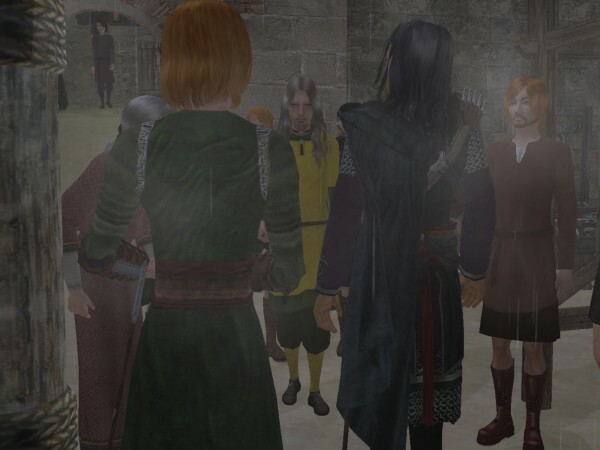 “Ah… no, lord,” the guard said, “I’m begging your pardon…” He bowed again for good measure. Morrann whacked a piling with the flat of his hand and made a strangled sound. The desperate guard glanced back at the shore. The guard’s eyes went wide. “No, lord,” he breathed. Murchad turned his shoulder to the useless creature and glared at the ship. He was angry and frustrated, and underneath all that he was afraid. He had never received such a cold welcome in Dublin. His sister was ill, and Sadb was increasing. A thunderstorm menaced. His captain was missing, and the sailors were tired and confused. What was he supposed to do in such an inauspicious situation? Could they make it back to Two Ladies under oar? Then he glanced up at the other ship preparing to quit the port, and his stomach sank. She was a warship, fit for carrying no cargo besides a load of warriors. She was sleek and fast and could row circles around Murchad’s fat-​bellied merchant ship. Was that why she was being made ready in spite of the coming storm? To prevent him from escaping the harbor? 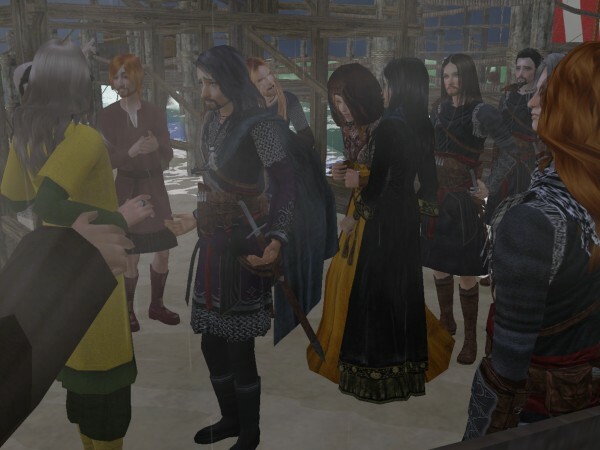 A flash of golden skirt caught Murchad’s eye as Sadb stirred in the cabin. His brother’s widow and child were in his care. His frail sister trusted him completely. He could not fail the ladies. He would strut and stick out his chest and bluff all the way to the King if he had to. The guard blanched again. Clearly the man wasn’t going to be of any help. Murchad stuck out his chest and strode past him towards the stairs. Morrann snorted in satisfaction and fell in beside him. Murchad couldn’t guess which “they” the guard meant. 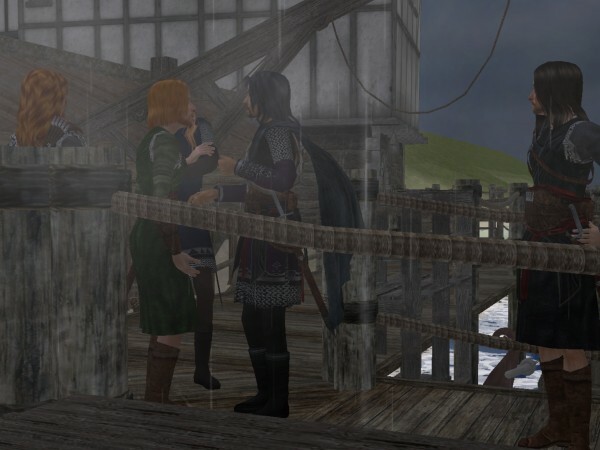 He and Morrann pulled up short just past the stairs, bewildered by the crowd that was pouring onto the shore. There were priests among them, murmuring prayers and tracing Crosses in the air. A dock worker let out a cheer. And an ominous murmur rose around a team of men who were cleaving a path through the mob. 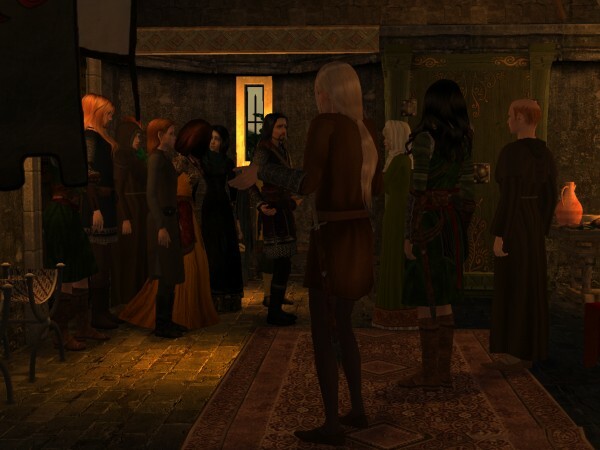 Most of the newcomers were dressed in green—more guards—but the point of the wedge was a tall blond in dandelion yellow. He scattered men before him with the force of his glare. It was Olaf Haraldsson, High Steward of Dublin. Murchad knew then he was about to get his questions answered. He wasn’t sure he was going to like the answers he was about to get. Murchad nearly begged the man’s pardon, but his interview with the guard had reminded him how servile that could seem. Just in time he caught himself, and he lifted his chin a little higher instead. Never speak when you can be silent, his father always said. Haraldsson stopped. His face streamed with rain, his pale hair was ropy and wet, and his fine tunic was getting soaked, but he met Murchad’s gaze, noble man to noble man. Then, simple as that—Murchad wondered how he’d done it—the High Steward of Dublin surrendered, dropping onto one knee at Murchad’s feet. The ominous rumbling of the crowd erupted into cheers, as if they had feared some other outcome. Haraldsson lifted his hands, holding some twisted, glinting thing up to the rain. He tried to give it back, but Haraldsson was already getting up, brushing the dirt from his knee. “I misdoubt there’s been a misunderstanding!” Murchad shouted over the surf and the raucous crowd. “You’ll understand by and by, lord!” Haraldsson shouted back. “The horn!” some other man said, and the word was picked up and echoed through the mob. He turned to Morrann, hoping vaguely to hand it off to him. 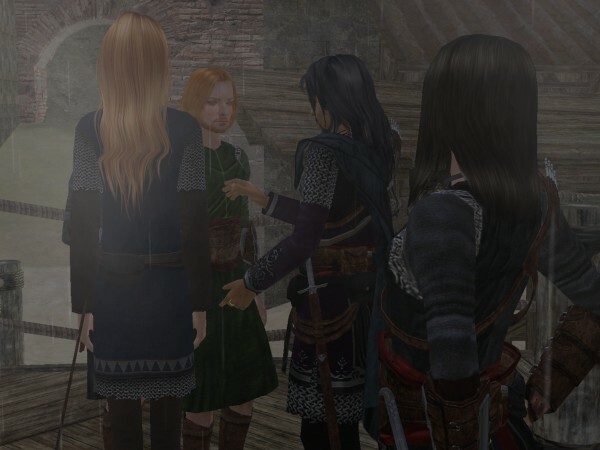 But Morrann was occupied with scolding the girls even as he helped them down the stairs and through the crowd that was spilling into the space Murchad had left between himself and the docks. “What’s going on?” Uallach asked. She looked wobbly, but she was hanging from Sadb’s arm, and Sadb had gotten her color back, and looked sturdy enough for two. “I most certainly did not!” Murchad wailed. 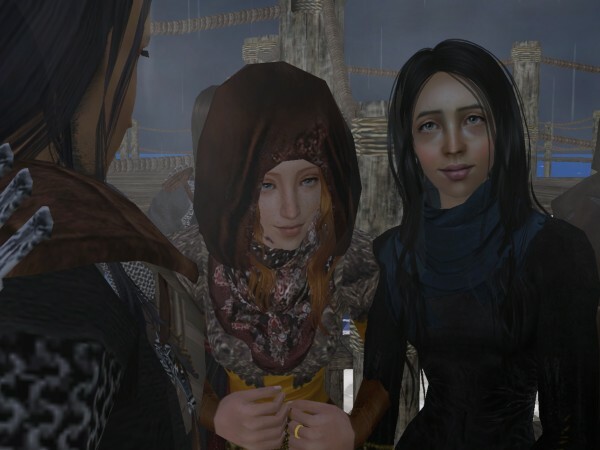 “’Tisn’t always like this, when you arrive?” Uallach asked timidly. Someone was pulling on his elbow, and another was tugging at his cloak. In the press of bodies, Murchad could only spot Father Gilla Mochutu in glances, when the little priest jumped, and his tonsured head popped up between two pairs of jostling shoulders. 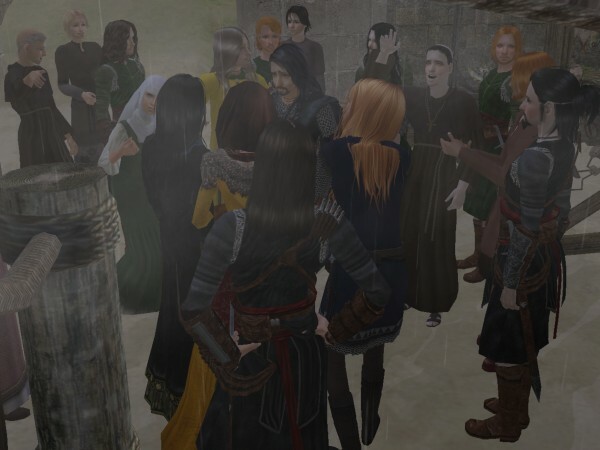 He was trying to reach Murchad, but people were getting closer, crowding around the girls. Murchad had never before heard a hundred voices raised in awe, but with the rain pattering down, the water swishing the shore, and another growl of thunder rolling across the sky, it all sounded like the beginning or the end of the world. 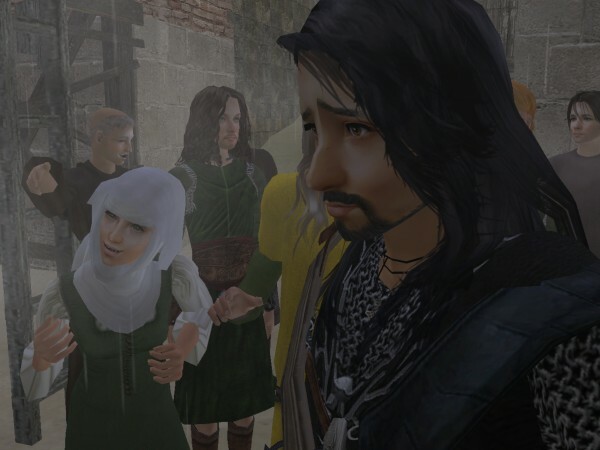 Slowly, his heart sinking, Murchad turned to look at the girls. The rain was soaking into Uallach’s hair and making it blacker than ever—black as a raven’s wing. And Sadb’s curls were beginning to escape from her braid, and a few of them straggled from beneath her hood, wetted to fox-​red. Uallach gave him a little smile, and Murchad nearly groaned. He never did think these things through. He might as well have been speaking in tongues. Word of the two ladies was filtering from the front of the crowd to the people gathering behind. Little boys with their hair plastered to their heads were dodging between legs to come closer. 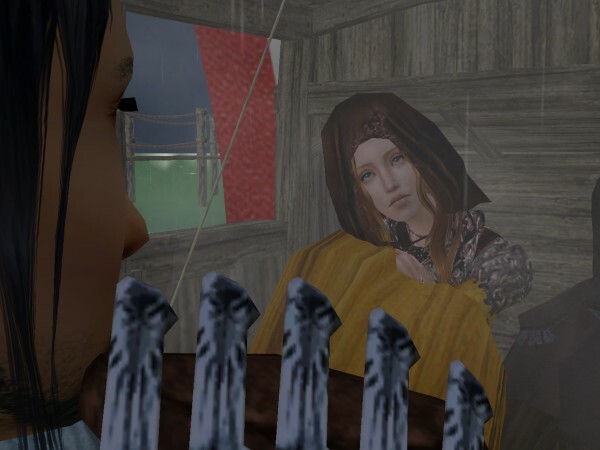 Murchad saw a rain-​wetted lass being heaved up onto a man’s shoulders, trying to get a better view. “We have to get away from here!” Murchad said, turning desperately to Haraldsson. Haraldsson was snapping his fingers at his men, already giving orders, but he turned back to Murchad and inclined his head. Murchad mimed a swollen belly with his hands and stuttered in search of a modest word. Before he could find it, he heard a familiar voice hollering “Make way! Make way!” with a familiar tone of annoyance. It sounded like Cynan son of Gruffydd, and it did seem the fellow had enough authority to make some progress through the crowd. Murchad craned his neck, trying to spot him, but Cynan wasn’t much taller than Father Gilla Mochutu. And just then a few sharp shouts of outrage on the shore behind him swelled into a roar that rolled over the mob like wave. It crashed right over Murchad’s head and went on to rise as high as the ramparts. Murchad had never heard a hundred voices raised in anger, either. But the dead of Ramsaa must have abandoned Diarmait to his grave and floated off to haunt Diarmait’s brother, for the sound struck deep into Murchad’s soul, and his senses scintillated with warning. He yanked his sister closer and clamped her against his side, but that left him staring into Sadb’s flushed face and sparkling eyes. Holy God, there were two of them, and he needed one arm for his sword! He shouted, “Morrann!” and he was gratified to hear Morrann reply at once—“Aye, lord!”—even if he couldn’t quite see where Morrann was. He couldn’t see any of his black-​garbed men at all. He turned and twisted, but he couldn’t figure out what was happening. 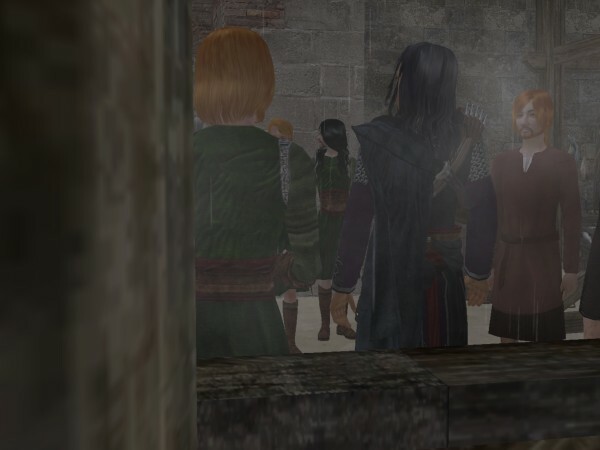 The men crowding in before him were staring off over his head, and the men at his back were falling away, leaving room for both Morrann and Father Gilla Mochutu to come up behind him. And then Cynan broke through the crowd ahead. He met Murchad’s eye, took in his defensive hunch over his sister in a single glance, and finally looked up at Haraldsson. “Muirchertach!” Haraldsson growled, forgoing any of the King’s titles and even the simple courtesy of calling him “lord”. Murchad looked up at Haraldsson’s pale beard from below. His jaw was set, and he and Cynan were both staring past Murchad at the harbor. Murchad tried to look, too, but he dared not let go of Uallach, and he only glimpsed a solid wall of backs and a raised fist. “Should we let him go?” Cynan asked. Uallach had wriggled around to peek out from beneath Murchad’s chin. Murchad was just about to introduce her when Sadb popped up at his elbow, and abruptly Cynan was all gaping mouth and bugged eyes. 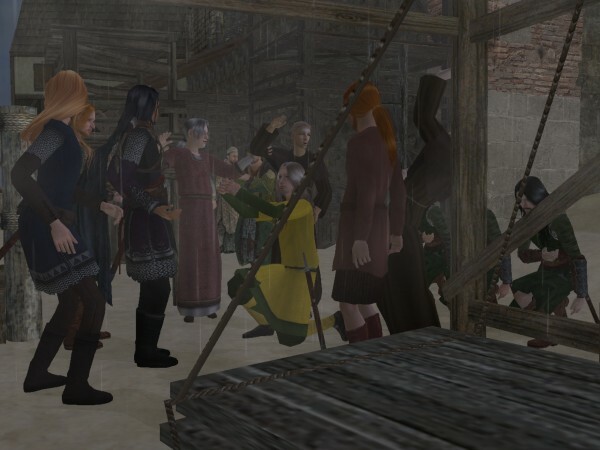 Cynan nodded at Haraldsson, and at once the guards turned around and began forcing their way through the crowd. Murchad and his little party were hastened along after them. Sadb was bouncing along at his side, looking all around, but Uallach was shuffling and cringing. “I can do it,” Uallach insisted in a pitiful little voice. Murchad nearly groaned. 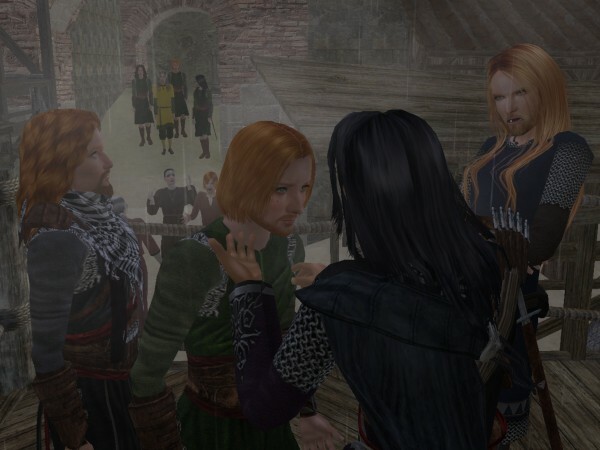 “Allow me, lady,” Morrann said, having materialized out of nowhere. Where was everybody? Murchad kept one hand on his sister’s wrist while he looked desperately around for Father Gilla Mochutu. The priest was lost again to the jostling bodies surrounding him. “I don’t want to be any trouble,” Uallach whimpered. “’Twould be an honor,” Morrann said. The next thing Murchad knew, Uallach’s arm was yanked from his grip. He spun around and smacked his face right into the flapping hem of her dress as Morrann hefted her up. Someone shouted, “The two ladies!” and another cry went up from the crowd. 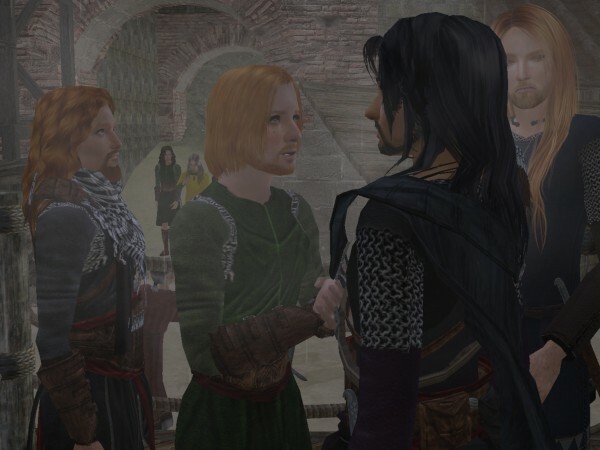 Uallach said, “Oh, my!” again and clung to Morrann’s neck. That took care of Uallach, but where was Father Gilla Mochutu? Murchad kept one hand on his sword and sidled up the road between Morrann and Sadb, glancing backwards for the little priest amidst the riotous crowd. People cheered and waved at him through the spaces between the guards, and wee children evaded the guards’ notice entirely and trotted alongside. Murchad smiled distractedly and waved back at everyone, but he hardly noticed what he was doing or where he was until they’d left the shore behind and passed through the harbor gate into the streets of Dublin. A sudden hope inspired him, and he turned back to Cynan. He shouted, “Cynan! Is Cearball in town?” Cearball lived above a tavern and knew the mood in Dublin better than anyone. Murchad deflated, abandoned to his fate. As they moved through the more densely populated streets, the shutters of every window overhead seemed to be swinging open, revealing fat housewives and toothless grannies who waved dishtowels for banners and called Murchad’s name. There was no need for him to strut and stick out his chest today: clearly everyone knew precisely who he was. “You never told us you were being so popular!” Sadb shouted at him. Haraldsson grunted and concentrated on keeping the crowd back. Someone in the crowd must have overheard their conversation, for the people who’d been shouting Murchad’s name and “two ladies” and “miracles” were suddenly demanding to see the horn. Murchad stopped short, paralyzed by a sickening realization. Sadb noticed and turned back. She flipped open the bag that had been bouncing against her hip all this time. Murchad watched helplessly as she pulled out the gleaming horn and thrust it high above her head. “The horn of Mael na mBo!” she cried. A moment of astonished silence fell over the people who crowded the narrow street, followed by a roar. Murchad lunged for the horn, but Morrann spun around and whacked him in the face with Uallach’s skirts. “What are you doing, fool woman?” Morrann thundered. Murchad flapped the skirts aside and reached for the horn a second time, but just then Sadb turned to face Morrann and clenched her fists beside her hips—horn included. “Whom are you calling a fool, you pompous mule?” she shouted. Murchad groaned. Truly Sadb and Sigrid were cut from the same cloth. She’d picked up squabbling with Morrann right where Sigrid had left off. “Sister, put it away!” Uallach pleaded, panicked by the people pressing closer, all trying to get a glimpse of the horn. Haraldsson stopped beside the four of them, bewildered. Cynan turned around and gave them all a look of impatient disgust. Hot with embarrassment, Murchad snatched at the horn a third time and finally caught it. He held it high behind his head to keep it away from Sadb, only to hear the people shout again, louder than ever. God help him, he never did think these things through. “Give me that bag!” he ordered. Sadb slipped the strap over her head and handed it over, meek as mice. Murchad stuffed the horn inside, buckled the flap, and slung it over his shoulder. “To the castle!” he shouted. Even that made the people cheer. He charged up the middle of the muddy street, with Morrann striding alongside and Sadb scurrying more than she was bouncing. But they had stopped long enough for Father Gilla Mochutu to catch up, and he finally burst out of the crowd, his cowl askew and his bald pate shining with rain. The little priest squeezed in between Morrann and Murchad and flipped his hood back up over his head. They turned onto Castle Street, and the fortress came into view beyond the sharpened stakes of the palisade. The stones were dark with rain, but the castle appeared almost ghostly against its sinister backdrop of black clouds. The bag thumped against Murchad’s sword belt as he trudged along, and he remembered the words of Young Aed: Through that horn surely the Devil’s work will be done. Murchad shivered. Just what was he walking into? He crossed himself, folded his hands against his breast and began to pray. A wave of silence started where they stood and spread outward, running up and down the streets to quiet the babbling crowd. The rain pattered down on the heads of Murchad and the people of Dublin alike, and splashed into puddles, and dripped from overhanging eaves. 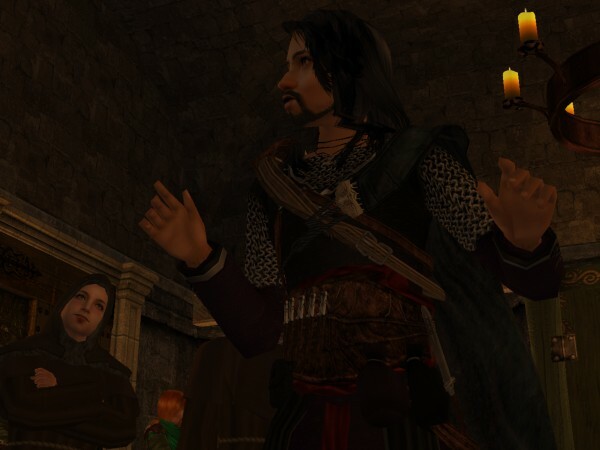 Uallach’s feather-​light voice joined them, buoyed up by Morrann’s baritone. Sadb chimed in, and her high, clear voice rang against the walls. Another wave rolled over the crowd: this time a rumbling murmur as men and women began to pray along. Murchad’s eyes spilled over with grateful tears that mingled with the rain. Surely the Lord would hear the prayer of an entire city. Surely He would send an angel to watch over them. Like a party of bedraggled pilgrims they trod up Castle Street to the castle. The boisterous crowd had stilled to a sacred solemnity, crammed against the walls on either side of the street. And everyone—man and woman, oldster and child, Gael and Norseman, even the guards who swung open the gate—chanted the prayer of Saint Patrick. A flash of lightning touched every face with a ghastly light, and a grumble of thunder briefly drowned out their voices, but Murchad was not afraid. What mattered a passing storm? He felt the sheltering hand of God cupped over the city. The feeling lasted until they stepped into the castle. The roof abruptly cut off the rain, and the slamming door cut off the sound of the people’s prayer. Murchad lifted his head and blinked into a darkness that was scarcely relieved by torches. The silence was chilling. The dank air and damp stone smelled more like catacombs than castles. The guards along the wall stared bug-​eyed at Murchad and his party before they remembered themselves and bowed. Then everyone turned to Murchad, those who had proceeded him and those who had followed. Even Sadb looked stunned and meek. They all watched him, seemingly waiting to see what he would do. Murchad stared back. He hadn’t the slightest idea. Murchad looked behind him. Nobody there but Father Gilla Mochutu and more guards. Murchad was not accustomed to Cynan addressing him as lord, but unless Cynan was talking to himself, he couldn’t see whom else he might have meant. “Then… let us go into the hall,” Murchad ventured. That worked even better than he had feared. The doorkeepers bowed and hastened to do his bidding. The doors swung open, revealing the mellow firelight of the hall, touched with rain-​colored gloom in the windowed alcoves. Everyone seemed to be waiting for Murchad to go first, so he went first, flanked by Sadb and Morrann coming a step behind, and followed by Father Gilla Mochutu. Murchad stepped inside and turned automatically to his left, expecting to find the King’s secretary, who would note his and Morrann’s return to Dublin and perhaps, if the King had some fault to find with him, bid him have a seat in the drafty alcove and await his lord’s convenience. Those were the rules. Sweet, comforting rules! How like a mother’s guiding hand: gentle, yet firm! It was the last time the rules were going to do Murchad any good. For no secretary sat in the corner. Murchad turned—slowly, heart sinking—to scan the faces of the people assembled in the hall. Coming at him with the King’s gilded goblet was Cynan’s grandmother, Ragnaillt, daughter of the long-​dead King of Dublin, Sigtrygg Silkbeard. Lined up beside her were the Bishop of Dublin, the Commander of the Guard, and the Commander of the Navy; and the city’s High Steward stood by the door, his head lofty in spite of his dripping hair. And in the midst of them all stood Murchad, weighted down with weapons and mail and wearing the ancient battle horn of the Chennselaighs on his hip, while the rightful King of Dublin fled the city in a storm, carrying off little more than one ship and a suit of clothes. Murchad saw that he had entered a world where rules had been set aside. Henceforth he would have to make up his own or do without. I feel as confused as Murchad. Yesssss!!!! Queen Synne has a nice ring to it. Eirik, you done good! Or so we hope…I love the political drama. Cearball setting up a lovenest, LOL. Epic!! The events unfolding as they walked up Castle Street were playing within my mind like a movie reel. I could envision everything, heard the calls, murmurs, raised voices .… sent chills through me. I would dearly love to see this chapter (this whole story actually!!) enacted on the big screen .… or even TV. Beats the Tudors or Borgias anyday. Ha! I knew Eirik was playing King Maker! Oh Murchad. is missing the possessive on Uallach. Wow! Just wow! My head is spinning like mad just now. :Agrees with Van: Poor Murchad! I would like to apply my Karma (officially I have nine, but there are more than that from before) to finding out what is up with Kraaia. This was typical Murchad, no doubt about it. Eirik obviously got it wrong with his first choice, but made up for it in spades with the second choice of the two brothers. Question is – just what does this kingmaking business offer him in the longterm? One is a kingmaker only for very specific reasons. And I do so hope that this means Eirik’s health will improve so he can see his works come to fruition. Murchad as King of Dublin. I really like that. And I am in complete agreement with Wawa, though I’ve had the same thoughts for the past year. Lothere should be a broadcast series. This is a fantastic set of stories, and on screen would be spectacular. There is enough material here to keep viewers happy for a few years. AND NO SPINOFFS! What you get that week is just what you would get by reading the story. I nearly fell out of my chair when Murchad was handed the key to the city. FELL OUT OF MY CHAIR! And now to actually finish reading the chapter. Man, this storyline never stops being epic. Every additional update leaves me with my eyeballs falling out of my head and rolling across the desk. Long Live Murchad the Hapless!!!!!!! I mean, initially I was just surprsied he had both Uallach AND Sadb with him (wonder how he wrangled that one? Clever Murchad), and then it just went wild from there…Oh well, all I can say is I agree with Penelope…Long live Murchad the Hapless!!! I posted some outtakes on the Verso blog: pictures of things that happened after curtain officially closed on this chapter. AND NO SPINOFFS! What you get that week is just what you would get by reading the story. It’s a medieval soap opera, I tell ya! Am I the only one who was NOT surprised by this turn of events? I did some sleuthing with someone in the chat ages ago and we figured this is what Eirik was up to. Bravo if you worked it out. There wasn’t much in the way of foreshadowing. More like pieces falling into place. For me, what is most surprising about all of this is just how well it all works. It’s one thing to guess that Eirik is trying to get his brother-​in-​law on the throne of Dublin (Or just installed as lord of Ramsaa? I thought that was the intent but I’m really not so sure anymore. I wouldn’t doubt anything of Eirik.) and another to see his plan become more successful than his intentions, what with the universe conspiring in his favor. The planning is in its self impressive but the happenstance and the way that everything unfolds are so brilliant. Murchad just happens to show up in Dublin with two ladies on his arm— No way for Eirik to have planned that. Or that miraculous burning horn incident. It wasn’t even guaranteed that that aspiring bard would manage to learn the two ladies legend. It was Seiza and I (I dug through my comments), after “Murchad gets a message from the dead.” She’s the one who figured most of it out, although I helped. When it got to the part where Murchad was wondering what was taking so long for permission to disembark, I had an inkling of what was transpiring. It was nice to see my suspicion was correct. Could it be that Eirik’s intention all along was to have BOTH brothers placed in those positions, one as lord of Ramsaa and the other as King of Dublin, but because of Diamait’s treachery that plan had to be slightly altered? or was it simply a misjudgment as to the better of the two brothers? Personally, I think the three of them positioned on all sides of the Irish Sea would be intimidating, what with the backing of Old Aed and the black Colin clans, and Sigfrith. Well, here I go thinking too much… will stop now. And YES, it IS a medivael soap opera. A right dandy one, ta boot! OMG is he really the king now? I never imagined Murchad as a king.. he would be a just one though. where did his men go once the insanity began? My thoughts are working overtime in that the guards may have defected to the fleeing king. What is Old Aed going to say about all of this? I was wondering if anyone else got chill until Wawa said it. For a little while I thought something tragic was going to happen. I was as worried as poor Murchad. I think he could be a good King. At the moment I think he just wants to call the old king back and beg his forgiveness. Murchad is a man who wants to live a quiet, peaceful life. He wanted that secretary to be there. Then again, he is happy as lord over his people. He likes looking after them like a sheperd or a loving father. Remember that post about his thoughts on his people? It was a long time ago. I think he will soon be put to some ease when he realizes that even the lowliest peasant would stand up for him. Even the littlest child would act the spy, to report if anyone so much as spoke against him. Once he is content, he can do good things. Don’t you get the feeling Murchad would be the kind of king that makes sure the people are fed? That would value their lives over more riches for himself? But then there is his concern over whitehorn…I hope that goes well. I recently finished watching the Tudors, loved it, but this would be far superior. I don’t comment much, but I had to come out of lurking and say that I absolutely loved this chapter! It was absolutely breathtaking and if I wasn’t looking at the sim pictures (which are gorgeous as usual) I could totally see this playing out in my head in real life or, as others have said above, as a tv series. Can you even imagine a cast of actors who could play all these characters? Any who, I just thought I’d come out of lurking to say that I love this chapter now I’ll go back to lurking. I think I’ve missed or forgotten some key parts of this storyline. Why is the (old) King of Dublin fleeing the city?? Hard telling. They may have innocently gotten separated in the crowd, or they may have been escorted off the premises to prevent Murchad from making a run for it. When Murchad asked him what he should do with the horn, his father told him to “drink out of it, jingle-​brain.” But you know Old Aed expected it would be put to some other use. I think the old crawker was curious to find out what it would be. Thank you! That means a lot. This chapter had to be so much more than dialog surrounded by pictures… since I didn’t even have pictures for most of it, I had to evoke the storm, the crowd, the harbor, and the city with words. I am glad to know I succeeded. Why is the (old) King of Dublin fleeing the city?? He must have known Murchad had just landed and his time as King was up. The High Steward, the old lady, and their cronies appear to have orchestrated a coup d’état for Murchad’s unwitting benefit. The former King decided to escape before they got rid of him some other way. But that means he’ll live to fight another day. And that sums up exactly what worries me about this chapter. 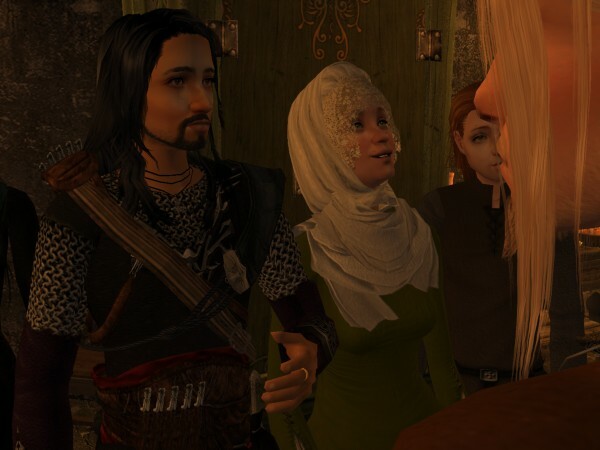 :worries: Be good to my Murchad and Synne… Gad, I love this whole storyline! Storm on the Irish Sea is turning into quite the show. My thoughts exactly, BonnieLaurel. When it read that they let the old king leave, and in a warship to boot, my thoughts – that one is going to come back to bit Murchad on the arse. What’s going to stop the old king from taking up with Whitehand? Yeah, I’m pretty sure this isn’t the place to put this, but I just wanted to let everyone know that I have officially been accepted to study abroad in Argentina for the Fall. Excited isn’t even the word to describe how I feel right now!! Congrats, Tiffany! That sounds like an amazing opportunity, and also a lot of fun!